Merry Christmas from Skid Row, where a decorated tree sits, staying lit all night. Nearby, a bar gets a last call. DotDotDash for a Saturday, December 22. FILM: You know the "The Soloist" is being filmed, so repeating old news, Jamie Fox plays Nathaniel Ayers, the "musician who dreams of playing Walt Disney Concert Hall." It comes from a series articles by LAT's Steve Lopez. Lopez is to be portrayed by Robert Downey Jr. . .––ADD: The director is Joe Wright, who is getting buzz for his storytelling in "Atonement," a sure pick for a best pic nom and means it will attract a lot of press beyond the built-in Fox and Downey interest. That also means more attention for Skid Row. 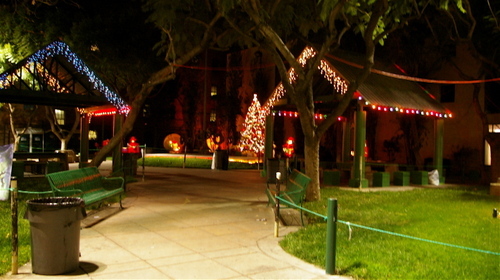 TV: KNBC will broadcast the one hour special "Forgotten Neighbors" on Dec 29 and explore homelessness in SoCA. It includes a profile on Lynn Blodgett, who photographs "the country's homeless and put a face on this forgotten population." . .–– Another segment is "Downtown Dwellers" billed as "They live in trendy downtown lofts in the shadow of Skid Row. Two worlds at a crossroads; what happens when the two meet? Mekahlo Medina reports on a man who is capturing the homeless story through words and pictures on his blog." . .–– For those who missed it, the blogger is yours truly. As for trendy loft, mine is old school. THE LOW-NO DISTRICT: The marquee reading Million Dollar hovering over Main St is an icon of a down-and-out Downtown and for decades has been eyed to be low to "no" income housing. The LowNo has new owners, Amerland, and they are being sued, along with property manager Logan Property Management, the city of LA and the CRA, by activists representing a slice of tenants who felt wrongly evicted. Consider it the last stand between Skid Row and a changing Downtown. QUICK NUMBERS: One homeless person dies each day in L.A. County, says a report by the Los Angeles Coalition to End Hunger. Only 17% can find shelter. Average age is 48 years old. MEANWHILE: Fifty of the "most vulnerable" Skid Row homeless people will be moved into apartments and provided services by the county, possibly as early as mid-January, county officials announced. Some consider it a band-aid to a larger wound. Other's maintain it will save taxpayers millions of dollars. And like every program that comes through The Nickel, Project 50's goal is to change the face of skid row. QUICK DRINK: Main St's Craby Joe's is closing Christmas Eve and Richard Schave (and Kim Cooper) of Esotouric invite all for last call at the bar that onced served John Fante, Charles Bukowski and nameless others . . –– Count on Esotouric to use a quote of note; "Please join us there around 10 pm this Xmas eve for what Hemingway wrote of the custom in his beloved Spain, 'La Penultima--the next to last drink,' for the last one is too bitter a thought" . . –– OUR 2 CENTS: From the video was filmed on the building that holds Craby Joe’s. "I'll show you a place, High on a desert plain, Where the streets have no name.” Last poison rain pours at 10 pm. WINTER SOLSTICE: Central City East posts about the vigil held on the longest night of the year, a memorial for those who died on skid row this year. Some passed by crime, others by neglect: Linda Susan Dillard, Jimmy Ferguson, Marcos Gallardo, Lois Gauthier, Christopher Hall, JoAnn Crystal Harris, Hampton James, James Jenkins, Servilio Nuñez Madriaga, Jose Muñera, Cle Peters, Jesus Reza, Kimberly Richardson, Poonsak Sakorn, Theodore Shaw, Perry Lee Smith and Alex Tapia. . . –– There. The streets now have some names. 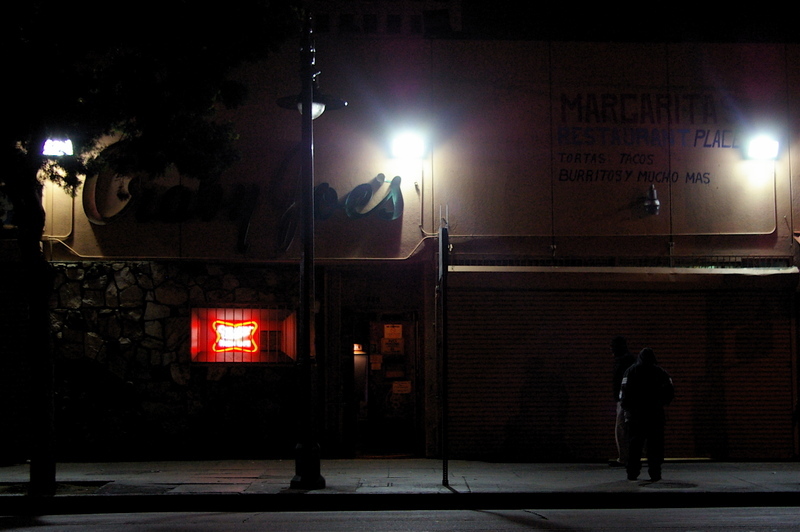 A dark and desolate Craby Joe's waiting for final call.